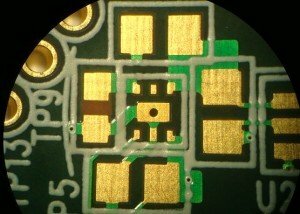 Recover expensive circuit boards from inexpensive solder mask defects. Unwanted solder mask can be selectively laser removed from most areas of a circuit board. It is common to find unintended solder mask on test points, through holes, and ground pads on rigid or flex circuits. No grinding or scrapping hand fatigue. Better accuracy and depth control than milling. No harmful chemicals that can deteriorate base dielectrics. No masking to protect and control solvent. Static-free process to eliminate ESD damage. No blasting grit cleaning required. Micron Laser Technology’s laser solder mask removal processes produce minimal carbon redeposits and prepare the surface for immediate plating, tin, or solder. In some cases, surface prep processes (post laser) like plasma may promote plating adhesion. Solder mask defined pads can be opened to any desired diameter holding a 25um tolerance. A control depth removal of solder mask can be used to lower solder mask below a metal plane to remedy component or connector reflow issues. Similar control depth solder mask removal eliminates probe tip interferences that cause false opens or failures. 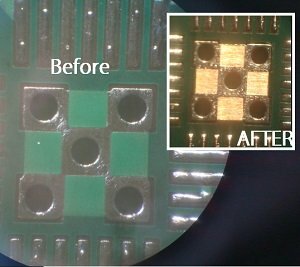 Laser selective solder mask removal will eliminated countless hours trying to manually rework solder mask by hand. Even permanent nomenclature can be reworked by laser to remove an incorrect part number or revision. 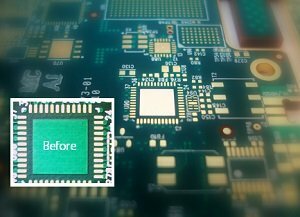 With the advantage of depth control, cleanliness, and feature size over other traditional techniques, MLT solder mask removal services recover bare and populated circuit boards that put your assembly and schedule back on track.